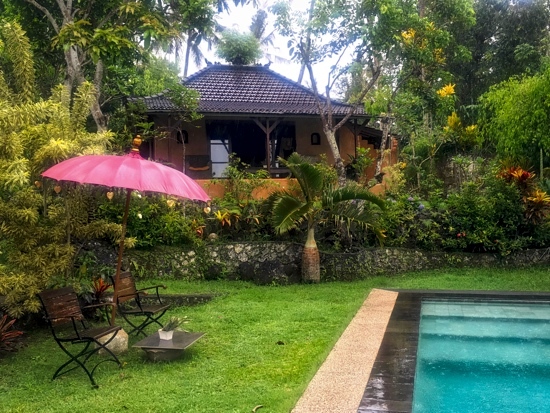 Tucked behind a high-walled compound along a lane off a back road behind Taman Tirta Gangga, Villa Gangga-Amangga is a little hard to find, but well worth seeking out. Average rating 9.2 from 51 reviews. 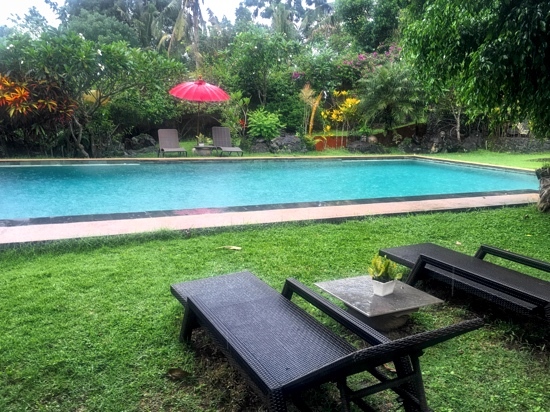 Run buy a Balinese and French couple, this upscale and well-appointed small hotel has just four comfortable and spacious bungalows overlooking a swimming pool with views out to sea. Beautifully designed with lots of earthy colours and a bohemian bent, each bungalow has different styling. Some feature handmade cement floor tiles and ornately carved wooden panels and furniture. Beds are comfortable and inviting with dark rich-coloured sheets, bedcovers and piles of colourful cushions. Among other artworks and artefacts, interesting kaleidoscopic photographs by the photographer host adorn the walls of each room. 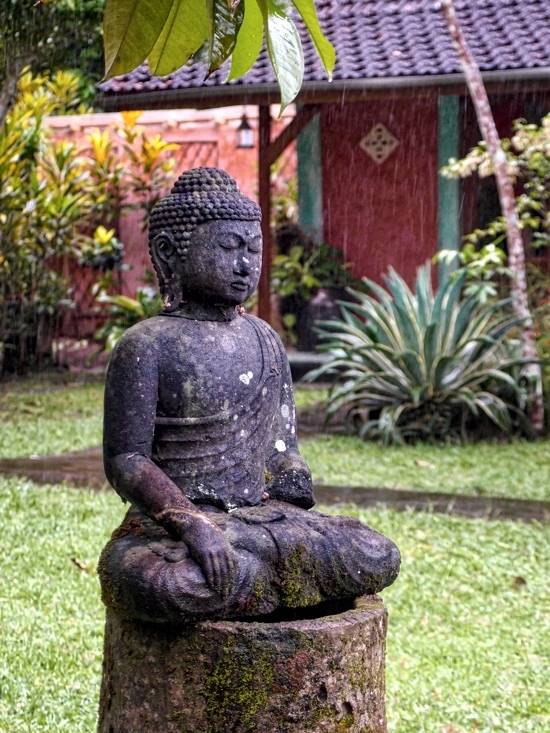 Yes, sometimes it rains in Bali. Rooms are fan-cooled, and can get quiet chilly in the evenings. Hot-water bathrooms are large, some with outdoor areas and bath tubs moulded into the colourful floors. Each bungalow has a private outdoor seating area, and all are different. All bungalows have similar facilities, but vary slightly in size and price. Lots of space for just hanging out. Communal areas around the hotel proved guests a relaxing space to meet and chat with the very affable and friendly hosts. The reception and outdoor lounge area features a huge carved traditional Indonesian wood panel which forms a wall of the family home. 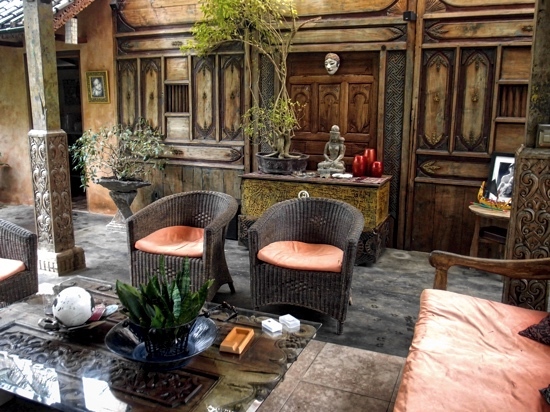 Comfortable rattan chairs and carved antiques make it a pleasant place to linger. Another magnificent ornately carved wooden wall hides a small cushioned-filled TV room. Sculptures are dotted amid the lush landscaped garden. Umbrella-shaded chairs and lounges surround the large and enticing rectangular swimming pool. It may seem a little out of the way, but you can easily walk to Taman Tirta Gangga — we are told it’s quicker than driving. There is also great trekking in the area which can be arranged by the hotel. 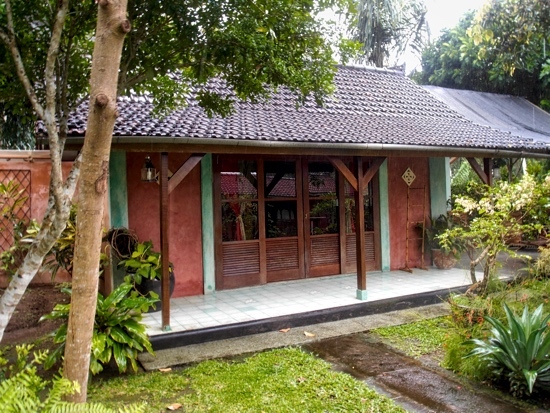 Villa Gangga-Amangga is family friendly with two adjoining bungalows. Kids will need to be watched by the pool though as it’s unfenced. Villa Gangga-Amangga’s website is only in French, and they get predominately French guests, but welcome all. Breakfast is included and other meals are available. Guests are encouraged to eat communally, and the whole hotel has a very warm, relaxing and homely ambience. Last updated on 21st October, 2016. Check rates at Villa Gangga-Amangga on Booking.com. Also: 1,400,000 rupiah and 1,500,000 rupiah. 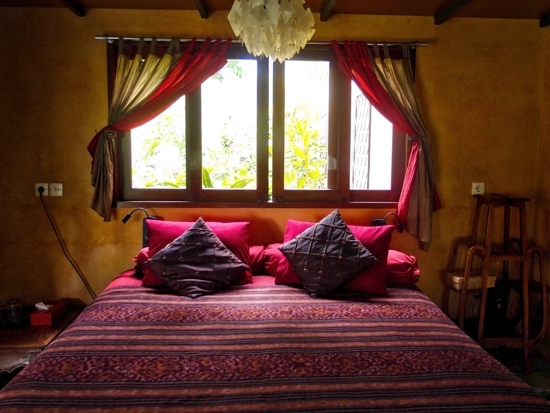 Room: Standard double room, low season: 1,300,000 rupiah, high season 1,300,000 rupiah. Notes: Also: 1,400,000 rupiah and 1,500,000 rupiah.